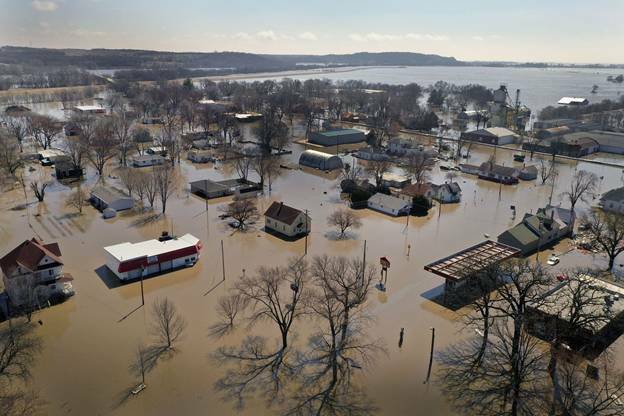 A record flood in the American Midwest has killed at least four people, displaced thousands, and caused an estimated $3 billion in property damage. The Missouri River Basin rose to record heights and broke its banks after hard winter rain couldn’t be absorbed into the frozen soil. And after the Spencer Dam was destroyed by the floodwaters, the U.S. Army Corps of Engineers was forced to open the Gavins Point Dam downstream to prevent it from being destroyed in turn. Grief and frustration linger in the flooded towns, but it’s difficult to know what the Army Corps of Engineers could have done differently. A decades-old flood control system coupled with recent extreme weather meant that it was difficult for the agency to make any better choices. On March 13, a bomb cyclone hit the upper Midwest, and the low pressure drew in warm, wet air from the Gulf of Mexico. The influx of air melted about a foot of snow and also brought between 1 and 3 inches of precipitation. The Spencer Dam wasn’t designed for flood control. Built in the 1920s, the dam was a hydroelectric flow-through dam, with garage-style doors that let water through. Crucially, the dam didn’t have an emergency spillway to let water through when water levels got too high. On the night of March 13, the dam collapsed under the weight of water and ice, letting the full storm surge through. The collapse left the personnel downstream with an impossible choice: keep their dam closed and risk it collapsing, or open some of the spillways and cause certain flooding. 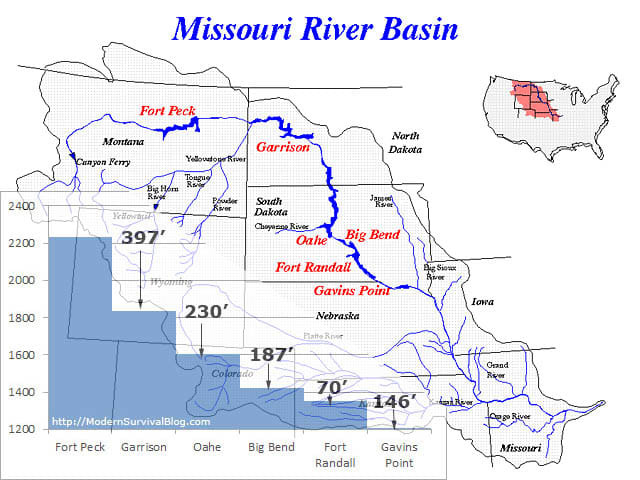 The Missouri River Basin, with the six major dams labeled in red. 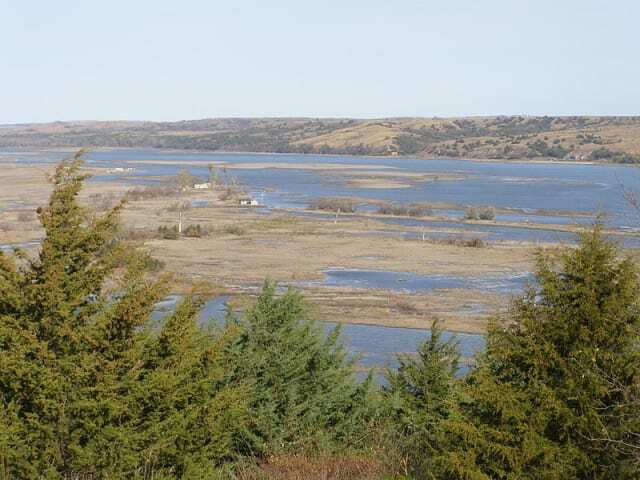 The Niobrara River (too small to be pictured) feeds into the Missouri right above Gavins Point. The Missouri River as it exists today is a marvel of engineering. It was once a very different kind of river; wide and shallow, it frequently flooded in the spring and ran low in the fall. But in the 1930s, the government thinned and deepened the Missouri so that it could reliably run shipping down the river, creating huge reservoirs that could help control its flood. The system of dams is deceptively complicated, as is balancing all the needs involved in the river. The Army Corps of Engineers, which manages the dam system, prioritizes how it will open or close the dams based on a 432-page document known as the “Master Manual.” The manual asks the Army Corps to balance eight basic functions: flood control, river navigation, hydroelectric power, irrigation, water supply, water quality, recreation and the preservation of endangered species. But everything else goes out the window when there’s a flood risk. On the morning of March 14, all eyes were on Gavins Point Dam, which sits where the Missouri River divides Nebraska from South Dakota, right below where the Niobrara feeds into it. Even after the upstream Fort Randall Dam cut its water release down to 0 cfs (cubic feet per second) that morning, the storage space behind the dam was running perilously low. A day earlier, Gavins Point had already increased its water release from 17,000 cfs to 27,000 cfs. And then the Spencer Dam collapsed, threatening the dam with the greatest water volume in 120 years of record keeping. Over the rest of the week, the Army Corps slowly increased the water release to around 100,000 cfs, the average volume over Niagara Falls during the tourist season. 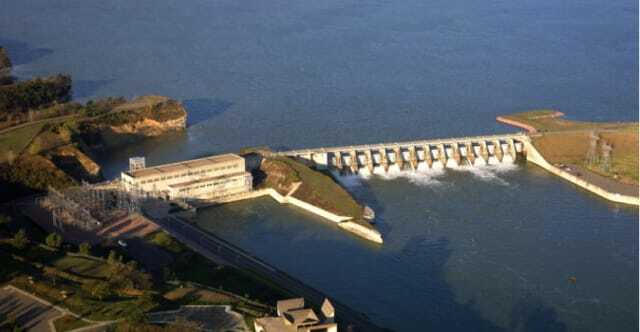 Gavins Point has 14 spillway bays, all of which were closed with radial arm tainter gates. To increase the flow-through, operators at the dam opened 12 of the bays, as the remaining two couldn’t be fully opened due to ice buildup. "We know there are communities experiencing flooding, or nearing that condition, along the Missouri downstream of our dams," said John Remus, chief of the U.S. Army Corps of Engineers' Missouri River Basin Water Management Division. "We are managing releases from Gavins Point as judiciously as we can in order to lessen the impact downstream." But despite the attempts to lessen the impact, the floods downstream were severe. Nearly 50 levee breaches were confirmed, and the Army Corps distributed 500,000 sandbags in an attempt to stem the tide. Towns were evacuated across Nebraska, South Dakota, Iowa and northwest Missouri, and returning evacuees have found that the floodwaters leveled bridges and swept buildings away. And while there is an ongoing investigation into why the Spencer Dam collapsed (and whether the Army Corps should have potentially noticed any flaws sooner), the general consensus is that the whole complex system is being worked beyond its capacity. The dams were built decades ago, and the water levels then were well below what the structures have to deal with now. “It’s human nature to think we are masters of our environment, the lords of creation,” Remus, told the New York Times. But he has no such illusions about what his dam system is capable of: “It was not designed to handle this,” Remus said. The worst of the flooding has subsided for now, but the news for the future isn’t promising. 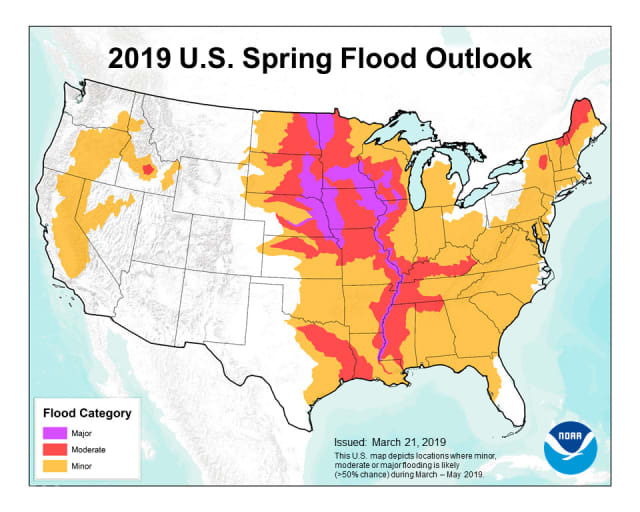 According to the National Oceanic and Atmospheric Administration, there’s still a threat hanging over the region later into the spring from increased snowmelt and rainfall. And the longer forecast is even more dispiriting. A 2012 report, commissioned by the United States Bureau of Reclamation, predicted that by mid-century there would be a 6 percent average annual increase in upper-basin runoff and a 10 percent annual increase in lower basin runoff. In other words, this anomaly might become the new normal. The question is, how can engineers adapt an old system to weather these modern challenges? One bold proposal is: don’t. Back in 2011, after another record flood wiped out multiple levees, Remus proposed moving the levees away from the river, ceding more land to the floodplains. When the government brought in engineers to tame the river, approximately 522,000 acres of floodplain was converted to farmland. That loss of floodplain makes it more difficult to protect the farmland around the river, necessitating higher and stronger levees. And, while levees can protect a specific area of the river, they also funnel floodwater downstream, making the river faster and deeper. This means that when a levee eventually breaks downstream, the damage can be catastrophic. But the plan is a hard sell with farmers along the river, many of whom already believe that the government is prioritizing the environment over their livelihoods. Last year, a group of farmers won a lawsuit for damages against the federal government, after claiming that the government was liable for flood damages dating back to 2007 for over prioritizing habitat concerns. Many feel that the government has been storing too much water in the reservoirs for hydroelectricity and habitat protection, so that floodwater is far more of a problem than it has to be in rainy years. Ultimately, the biggest problem is cost. While some deluged farmers might be keen to sell their land to the government to pull out of a difficult area, a land buyout is an expensive option for the government. Remus' 2011 proposal failed over budget concerns.